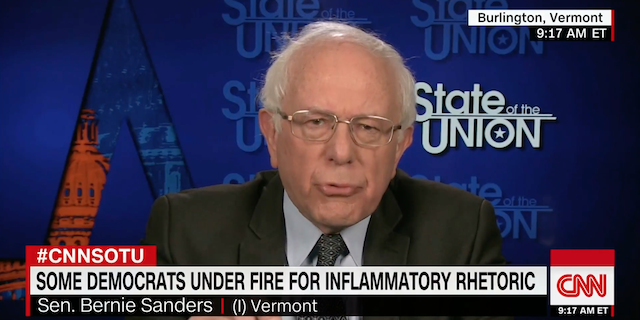 Bernie Sanders appeared on CNN’s State of the Union, where Jake Tapper asked him to address the rise in harsh rhetoric and “aggressive tactics” coming from Eric Holder, Hillary Clinton down to their shock troops over the harassment against GOP members. Sanders, of all people, should know better to directly answer a question like this than dodge it, as it was one of his, and the dem party’s, own who attempted to assassinate 30 GOP lawmakers! Instead he chose to go on a rant against POTUS and the GOP, talking free healthcare, climate change and class warfare. Sanders’ refusal on condemning leftists harassing members of the GOP, and supporters for that matter, proves this is the new democrat socialist party. Everything Eric Holder, Hillary Clinton and Maxine Waters are preaching is their new policy. No peace, civility, mobilize the troops and win at any cost. The socialist was right about one thing people better get out and vote. America you have 3 weeks to decide whose side you’re on: the democrats who want to go back to the obama years and expand on it, or the direction Pres Trump is taking us with the help of a handful of GOP members to make America great again.